The last few days we have been blessed with rays of glorious sunshine. Beautiful weather like this is far too good to miss so we took things outdoors - al fresco. I put together an impromptu shoot for a new ASOSMarketplace cover photo, sometimes the last minute things turn out the best, and the most fun. 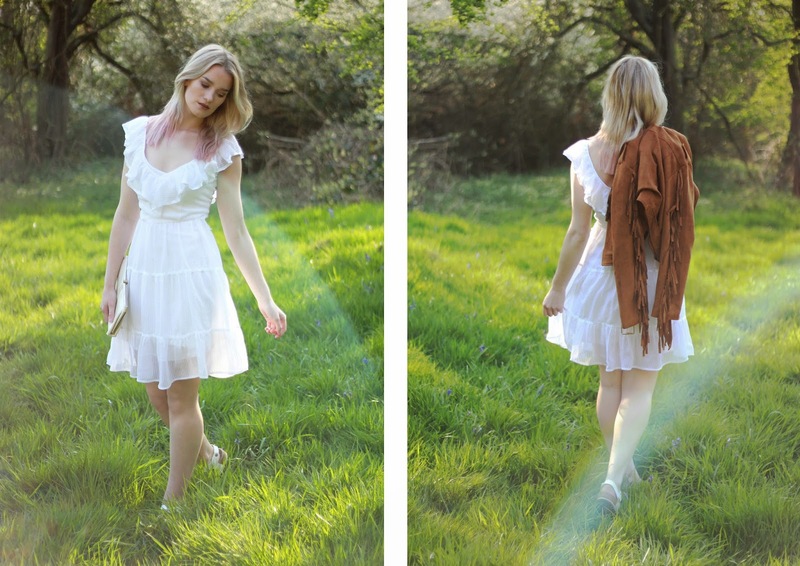 This 1970's white tiered mini dress has to be one of my favourite pieces in the shop right now. It has such a gypsy boho feel to it, making it perfect for teaming with a fringed jacket or suede waistcoat. The dress is girly and fun which matches my personality. It was just perfect for this shoot and for festival season! The bluebells and the blossom were out in full bloom which made the location picture perfect. Lets hope this weather is here to stay so we can adventure outdoors a little more. I am currently planning our summer look book shoot so keep your eyes peeled for lots of seasonal goodness arriving soon. You can find more beautiful 70's dresses and check out our new cover shoot on ASOSMarketplace.